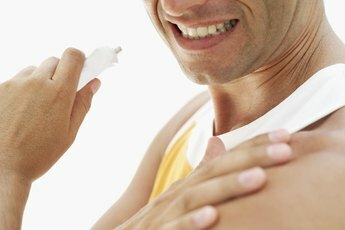 Stretching your biceps can help make daily activities easier. Your biceps are used on a daily basis when you flex your elbows and bring your forearms toward your shoulders. Stretching your biceps increases your blood circulation, promotes your flexibility and reduces your chance of injuries. Additionally, it can also help improve your performance during physical activities. The wall bicep stretch can be done almost anywhere and doesn't require the use of fancy equipment -- all you need is a wall. Stand upright with your back facing a wall, leaving about an arm's-length between your body and the wall. Spread your feet hip-width apart and point your toes forward. Bend your knees slightly, lean your upper body forward and raise your hands behind you as high as you can. Place your hands on the wall with your fingers pointing up. Aim to position your hands on the wall so they're level to your shoulders. Contract your abdominals to help stabilize your body and keep your back straight. Push your buttocks toward the wall, lower down into a quarter squat and lean against your hands to emphasize the stretch in your biceps. Keep your hands flat on the wall the entire time. Hold the stretch in your biceps for about 20 seconds before releasing it. Hold your body still as you stretch and stop stretching if you feel any pain -- you should feel a mild discomfort, but no pain. Stand upright, next to the end of a wall with your feet hip-width apart and your toes pointing forward. Alternatively, stand in a doorway. Raise one arm out to the side to shoulder-level and place your hand and bottom half of your forearm flat on the wall. Contract your abdominal muscles and slowly turn your body away from the arm that's on the wall so you feel a stretch in your upper arm. Avoid lifting your hand off the wall or turning too much -- you should only feel a slight discomfort. Hold this stretch for 20 seconds before switching arms. Stretch after your workout when your muscles are warm. Alternatively, jog in place for five to 10 minutes before stretching. Stretch at least two to three times per week to maintain the associated benefits. Consult your doctor before engaging in a new exercise routine, especially if you have a health condition or have been inactive for a while. What Muscles Do Dumbbell Lateral Raises Work? 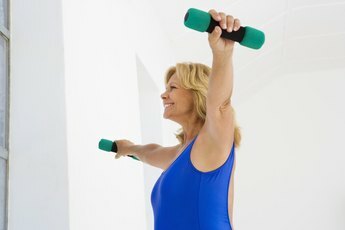 Do Exercise & Stretching Help Upper Arm Pain?